Tansee iPod Copy Pack is an all-in-one iPod copy solution. 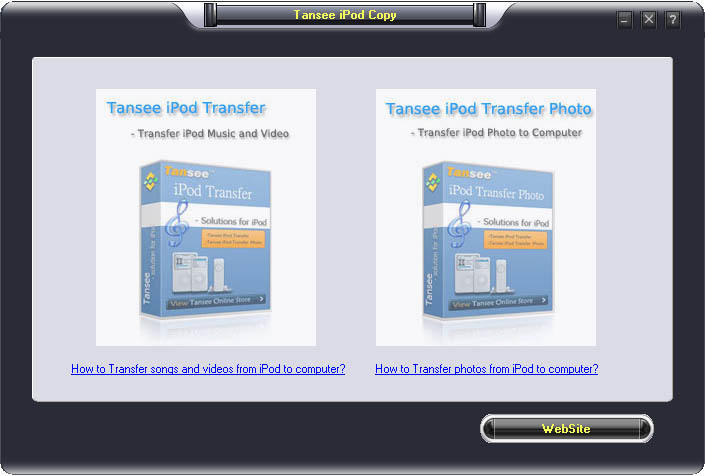 This Pack includes 2 software — “Tansee iPod Transfer $19.95” and “Tansee iPod Transfer Photo $19.95”. Now you can get this Tansee iPod Copy Pack at a very competitive price $29.95! Save $10! Tansee iPod Copy Pack is the ultimate backup tool for your iPod. It enables to easily copy your iPod’s songs/videos/photos to your PC. Whether you need to send your iPod for repair, retrieve your songs/videos/photos because of a computer / hard drive crash, or just to backup to a different drive, Tansee iPod Copy Pack will create an iPod copy effortlessly. Tansee iPod Copy is fully compatible with all existing iPods including iPod, iPod Photo, iPod mini, iPod shuffle, iPod nano, iPod video (including Harry Potter iPod and iPod U2), and new iPod shuffle, new iPod nano, iPod classic, iPod touch. Sending your iPod for repair. Moving song/video/photo to a new iPod. Share your iPod song/video/photo with friends. Tansee products can run on almost all the windows operating systems. Upgrade Free! Tansee’s product will upgrade with iPod synchronizing, prepare for the next generation iPod! Just one time fee, you can copy songs in next generation iPod. New To iPod Copy? Tansee iPod Copy Pack step by step user guide available. Just follow the steps, easy copy all your iPod content to computer.